Hiya guys. I just realized that we're only two weeks away from October aka the best month ever. I'm really excited about it and plan on having a slew of mani's to showcase. So far this new schedule has been working out really great and has reduced my stress tremendously. These next two weeks shouldn't be taken for granted, however, because I have a ton of beautiful collections to share. Because here at Manicured and Marvelous, it's another day and another awesome Fall collection to share month. 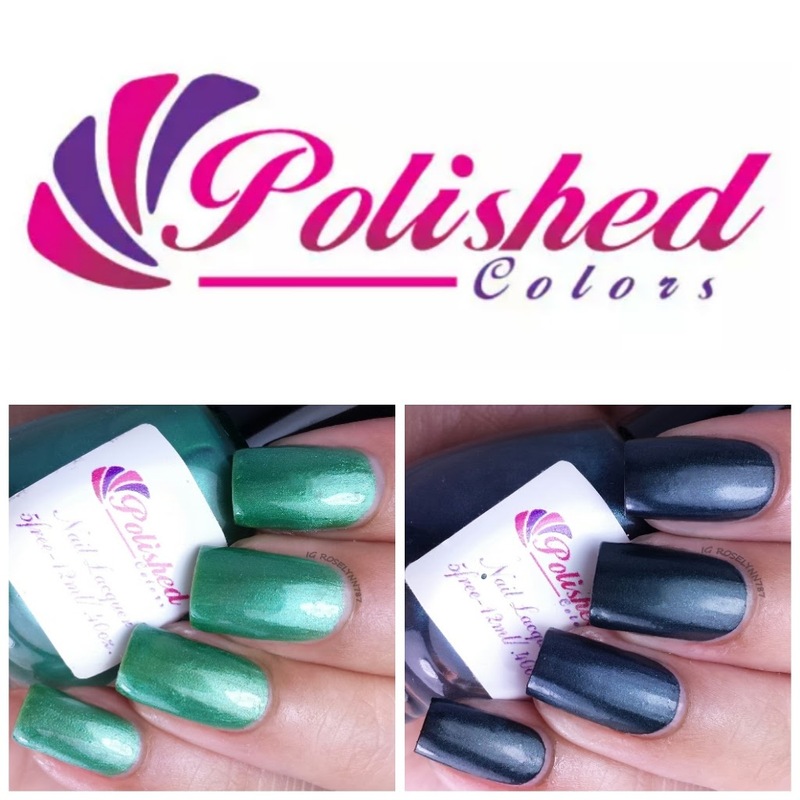 Today I have two polishes from the Egyptian Fall Collection by Polished Colors. I haven't reviewed a polish for Tasha in a year (pretty much when I first started this blog) so this was definitely exciting for me. Let's take a closer look. The Egyptian Fall Collection by Polished Colors will be releasing this Friday, August 19th. This is a seven-piece collection, however, I'll only be showing you guys two from this collection inspired by ancient times. Egyptian Nemes is a dark navy blue stain polish with a slight shimmer. Love this polish. It's a great shade that I haven't seen too often. I think the best part is the silky satin finish, though I'm sure it'll look just as lovely in a glossy finish. I did experience some cuticle staining with this polish, however, no nail staining - so be wary of your application process. The formula was also a bit on the thick side, but no unworkable. I did add some polish thinner to ease with the application. One amazing quality of this polish is the fact that it's opaque in one coat. Yup, you read that correctly. Though I did end up adding a second very thin coat to give it a fuller look. I decided against using a topcoat so you can could see the natural matte finish. Amazonite is a green-teal with a shimmer finish. It was quite difficult to truly capture the color of this beauty as it shifts a bit depending on the lighting. I do wish it leaned a bit more toward teal than green, but it's a nice color either way. The formula and consistency were great and gave me no trouble while applying. Make sure to allow time for drying between layers because the shimmer makes the brush strokes very noticeable. For these swatches, I used three thin coats and sealed it off with a topcoat. Overall I have to say the colors in this collection are very rich in shade and give off a great luxurious feeling. Despite it's formula issues, Egyptian Nemes is still my favorite amongst the two. I'm also dying to try it with stamping to see if it would works well. Another thing I'd like to note is I did speak with Tasha about the formula issues and she said she'd work on it in the future. That's always a plus. Another interest spark for me is the Egyptian theme behind the collection, personally I have not seen it done before. Definitely a nice and creative collection that matches up nicely with Fall-like color schemes. I feel like I'm a little kid counting down till the 13 days of Halloween.